Information has just been received from credible sources in Serui, West Papua, that Indonesian Army (TNI) soldiers are occupying the village of Mantembu in preparation for the arrest of Reverend Terrianus Israel Yoku, the Chairman of the National Congress of West Papua National Authority. According to witnesses in Mantembu, 30 armed soldiers from KODIM Serui entered Mantembu at around 9.30am asking the whereabouts of the President of Papua – meaning Chairman of national Kongress WPNA, Terry Yoku. The witnesses described via SMS that the soldiers are wearing full combat equipment complete with rifles, and ammunition. People in the village are very scared. The West Papua National Authority is a key sector within the West Papuan resistance movement, and is styled as a Transitional Government. It has played a leading role in the mass non-violent resistance movement across Papua. Together with KNPB, this week it boycotted the Indonesian-sponsored dialogue process of Neles Tebay and LIPI. Currently, the Indonesian Army are also attempting to capture the head of the TPN-PB armed resistance in Tingginambut, Puncak Jaya. Mantembu is the area from which the late ex-political prisoner Yawan Wayeni came. Wayeni’s death was captured on a Youtube video in 2009 after having been bayoneted and disembowelled by Brimob troops in a case that provoked international outrage, although no-one has been held to account for his treatment or death. Jayapura: According to the police, the arrest of five activists who were attending the commemoration of 1 July, OPM Day, was because they had mobilised people but had done so without having the necessary permit. ”They were not praying at the time they were disbanded,’ said a police officer. ‘If they want to pray, they can go to any place but they don’t need to gather lots of people together nor do they need to unfurl banners,’ said police chief of Jayapura, AKBP Imam Sietiawan. He said that the five activists, Marthen Goo, Herman Katmo, Bovit, Yulian and Sakarias Tamikai, had rallied people together without having the necessary permission to do so from the police. ‘When they saw this, my men arrested the five and took them to the police station, interrogated them for a while, and later that day, we sent them home.’ He said that a permit from the police is necessary if you want to rally people. He said that 20 or 30 people were holding up banners, although they said that they were only going to go to the grave of Theys Eluay to say prayers. Asked about notification that had been given by the committee, he said that there was no notification about gathering together a lot of people in Abepura. ‘It would be okay in Sentani. If they want to carry out these activities, please go ahead and do so. But they shouldn’t all gather together and wave banners. That’s not right. That is what is not allowed,’ he said. Jayapura: Thousands of the people of West Papua, coordinated by the West Papua National Committee, held rallies across Papua today to demand referendum to be held in West Papua. The demonstration was to commemorate the illegal occupation by Indonesia in West Papua in May 1, 1961. They also give full mandate to the government of Vanuatu, International Lawyers for West Papua( ILWP) and International Parliamentarians for West Papua (IPWP) to bring the political issue of West Papua to the International Court of Justice (ICJ). At the Lingkaran Abe, the central of city in Abepura, there was a mass sit-in, where open platform speeches were made by participants, and a joint petition was signed. According to Victor Yeimo, International Spokesperson of KNPB, this rally was held to demonstrate to the Indonesian and international community that the people of West Papua want self-determination thought a Referendum as a final and democratic solution. “We want to show Indonesia and the international community that we are not just a handful of people who want independence. All people of West Papua want to be free”. Mako Tabuni, KNPB vice chairman, read the petition and invited the people of West Papua to unite, and support the legal process which is being driven at the international level. Benny Wenda as a West Papuan leader in exile, also spoke directly from London via mobile to the thousands of people of West Papua at the rally.. This peaceful demonstration ended at 5:00 P.M. 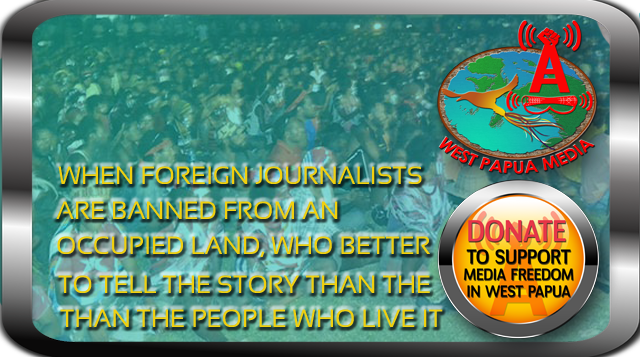 The KNPB also invited West Papuan people to join the next demonstrations to be held across all of West Papua. PAPUA NEWS: May 2 2011. 2. to challenge and resist the annexation of West Papua by Indonesia, and to continue follow up the demands by the 2nd Papuan Peoples‘ Congress to take the straightening of the history of Papua’s annexation by Indonesia to the next stage; the first stage was successful historical review of the Act of Free Choice written by Professor Pieter Drooglever. 3. to give support to International Lawyers for West Papua, with 60 international lawyers and the Government of Vanuatu who are assisting with a legal challenge to the annexation and Act of Free Choice of West Papua, that will occur on 2nd August 2011 in London, UK. The Coordinator of demonstrations across Papua is KNPB (Komite Nasional Papua Barat or West Papua National COmmittee). Demonstrations are also occurring in Biak, Serui, Manokwari, Sorong as well as Jayapura. Currently, approximately 2000 people are gathered outside the Governor’s office in Jayapura, conducting peaceful protests, political speeches, and placards. It is not known at this stage if security forces are attempting any dispersals. Six people, including a 10-year-old child, have been arrested in West Papua for delivering leaflets promoting major pro-democracy mobilisations across the country scheduled for May 2. According to Victor Yeimo, international spokesperson for activist group KNPB the names and ages of the arrested activists are Baroy Sambom (24), Etus Wandik (29), Victor Kepno (19), Agustinus Mabel (20), Tohmas Loho (21 and Yarimi Yare (10). Meanwhile, in Jayapura, West Papua, reports are coming in that the government pressure on activists is mounting. Large numbers of Indonesian troops (TNI) are patrolling and placing red and white Indonesian flags on most street corners. They are also forcing West Papuans to fly red and white flags in front of their homes to commemorate the annexation of Papua into Indonesia on May 1, 1962. KNPB, through demonstrations coordinator Mako Tabuni, has urged the people of West Papua to not be affected by the provocation of the TNI and to stay focused on the agenda of the demonstrations on May 2. According to its plan, announced last week, KNPB is organising the people of West Papua to commemorate the annexation more somberly as the beginning of oppression in Papua under Indonesian control. It is calling for mass demonstrations to demand a new referendum over the sovereignty of West Papua. Phone contact available to sources via westpapuamedia.info; please click on contact page for more details.